Landlady restores Grade II Listed Beech Hotel to former glory | West Leeds Dispatch | News. Views. Get involved! An empty Grade II Listed pub which boasts art deco styling and distinctive cladding is set to reopen – five years after regulars supped their last pint. New landlady Jaime-Leigh Gaunt, 26, is taking on the job of restoring The Beech Hotel, at the bottom of Tong Road, to its former glory. Many of the Beech’s internal fittings and fixtures are original and the pub is a rare surviving example of its type. “My stepfather ran a pub in Idle, so I’ve been in and around the trade for a while. I love it. I’m a people person and pubs bring people together. “The Beech is somewhere for people to come in the community, it’s ideal for people who don’t like Armley Town Street or who don’t want to go into the city centre. It’s a focus for the local community that they perhaps haven’t had for a while. “My dad used to drink in here, so it has a lot of memories attached to it for me. The new landlady, who will be running the pub with partner Melissa, says regulars will be able to enjoy Sky and BT Sports, and she’s hoping to introduce darts and dominos teams, restart the Beech Celtic football team and run a poker night where you can win a trip to Las Vegas. The free house will also boast open fires in its rooms to warm up chilly regulars this winter. 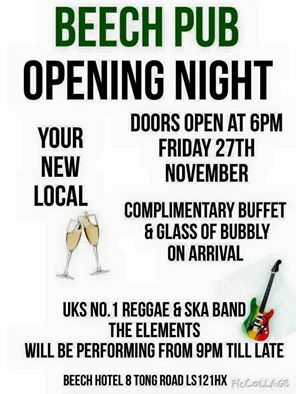 The Beech will reopen with a special event from 6pm on Friday, November 27, which will include champagne and a buffet and reggae and ska ban Elements from 9pm. There has been a public house at the front of the site in Tong Road since the 1850s, while the range of buildings at the back was occupied by housing in the past. A 1931 reconstruction by Melbourne Ales provided the layout and facade as they are today, with minor alterations. Melbourne Brewery was taken over by Tetley’s in 1960, before the pub was taken over by Punch Taverns. Punch sold The Beech in 2011. The Beech was named a Grade II listed building in 2010 by the Department for Culture, Media and Sport. Note: This article was amended on Sunday,18 October to calrify the opening date. Really glad to see your story about the Beech reopening. My grandparents used to drink there. Cheers! Thank you! Hope you can join us one time! I’m very proud of what I have accomplished in such short time. I mention every word and I am looking forward to the adventure. I was a regular in the Beech for many a year, we had the regulars who frequented the Beech every night when Stan Dodds ran it before John and his son. We had regular “Kalookie” games with the likes of JOHN MANUEL, BARRY THE BADGE, CUSH MUSH, RONNIE & BURT HILL, MYSELF (PETER RUMSEY) and many many more. It was a very friendly family run pub where you could get “anything” from the right person, it was a drugs FREE pub, anyone found with them was immediately “chucked out” by Stan…NO one ever argued with Stan, he was a great Landlord and a down to earth guy who took no nonsense from anyone. I hope the Beech gets the same kind of customers and it takes off, I would like to add that it is extremely gratifying to see a pub OPENING rather than closing down and this was one of the best pubs in the Armley/Wortley area along with the Crown next door. Our best wishes go to the new landlord/s and we sincerely hope it does well. Great to read past stories and memories created in the Beech. A lot of respect for previous landlords/ladies.